Essential reading for any investor aiming for success at the highest levels in the thoroughbred industry, this year’s magazine features industry articles on the future of racing in Asia, Champions that were overlooked as yearlings, how an auction works, plus insights from the bloodstock agent who purchased Dunaden and the breeder behind Black Caviar and All Too Hard. All Too Hard’s recent victory in the stallion making Caulfield Guineas underlines the dominance of Easter Sale graduates at the highest level, especially in a racehorse’s Classic year. From just 8% of the Australasian yearling sale crop Easter graduates have won 44% more Group 1 races for three-year-olds in Australia over the last ten years than any other individual sale. Entries for the 2013 Inglis Australia Easter Yearling Sale are headed by the most anticipated colt in Australia's thoroughbred auction history, All Too Hard and Black Caviar’s half-brother by Redoute’s Choice. The colt from blue-hen mare Helsinge is one of 48 siblings to Group 1 winners previewed in the magazine, including Typhoon Tracy, Igugu, Alinghi, Gold Edition, King’s Rose, Ortensia, Mosheen, Better Life, Starspangledbanner, Better Than Ever, Star Witness, Speed Baby, All American, Wanted and Zabeelionaire. Easter Sale graduate Samantha Miss was the dominant filly for her generation winning the time honoured Group 1 VRC Oaks, AJC Flight Stakes and Champagnes Stakes. The Champion daughter of Redoute’s Choice is one of 46 Group 1 winning dams with yearlings set for the 2013 Easter Sale, including Jolie’s Shinju, Sun Classique, Makybe Diva, Bramble Rose, Star Satire, Ruby Clipper, Rostova, Unearthly, Eskimo Queen, Our Egyptian Raine, Black Mamba, Dizelle and Absolut Glam. The subject of one of the stories in the magazine champion sire Fastnet Rock is set to be the most represented stallion at next year’s Easter Sale, with 50 yearlings featuring in the preview. High Chaparral (41 entries), Redoute’s Choice (37), More Than Ready (32), Encosta de Lago (26), Flying Spur (25) and Lonhro (25) are also represented by significant size drafts. “28% of all Australian Group 1 races for three-year-olds in the last ten years that were won by a horse offered at auction were won by an Easter graduate, setting a very high benchmark for all other sales,” Inglis Managing Director Mark Webster comments. “That fantastic statistic alone makes the Easter Yearling Sale Preview Magazine an essential read for anyone involved in the racing industry. 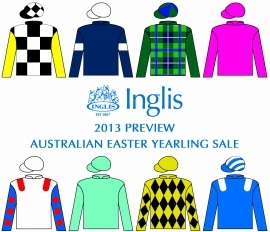 The online version of the Easter Preview features links through to all advertisers including studs and race clubs, stallion profiles that have been listed with bloodstock.com.au, race replays of Inglis’ Group One graduates and additional interviews with leading industry professionals.